A fellow artist once told me to save all my scraps of rice paper from the gyotaku and nature printing because I would be able to make paper from them. They were right, and ten years later I started learning the art and craft of simple paper making, and now offer a class in which we make our own sheets of “kozo” or paper mulberry, a common fiber for papermaking. It’s a full circle class, because the scraps that we don’t use go back into the paper making process. 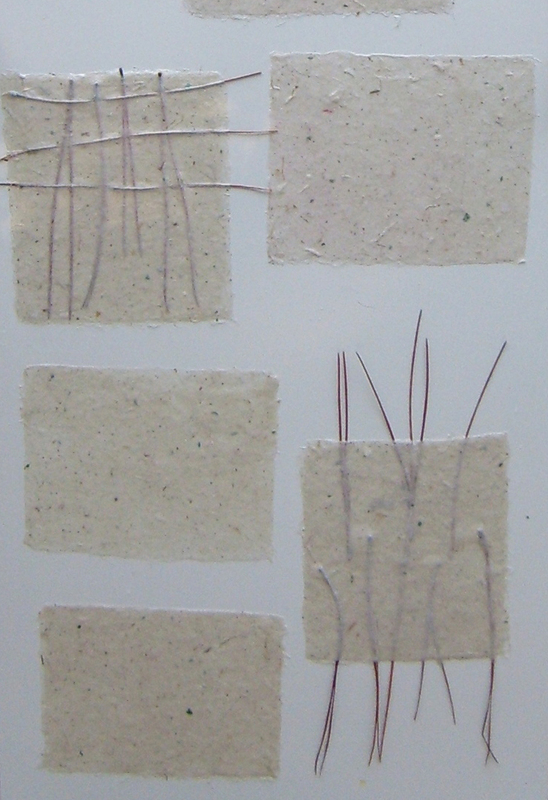 The first session is involved in making the pulp from the rice paper scraps and also purchased paper fibers such as abaca and cotton, supplemented with local eel grass fibers that I have processed. It’s a very wet process, using household blenders to mix the fibers into a pulp. 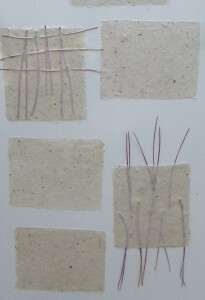 We can customize each sheet of paper with ribbons, plant parts, other fibers, or torn stamps or maps. The inclusions are endless. You’ll take your “post” (stack of papers) home to dry, and in a day you will have a nice selection of beautiful handmade papers. Occasionally I will run papermaking combined with a printmaking session the next week- titled “Pulp to Print”. 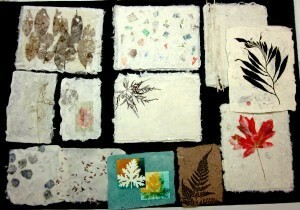 In this second session we’ll prepare inks and plants to nature print onto our handmade sheets. Each sheet of your paper becomes a work of art, suitable for handmade stationery, collage work, or can be bound into a handmade book. Expect to make and print at least 12 sheets of 8 x 10 paper, as well as additional sheets of smaller paper.